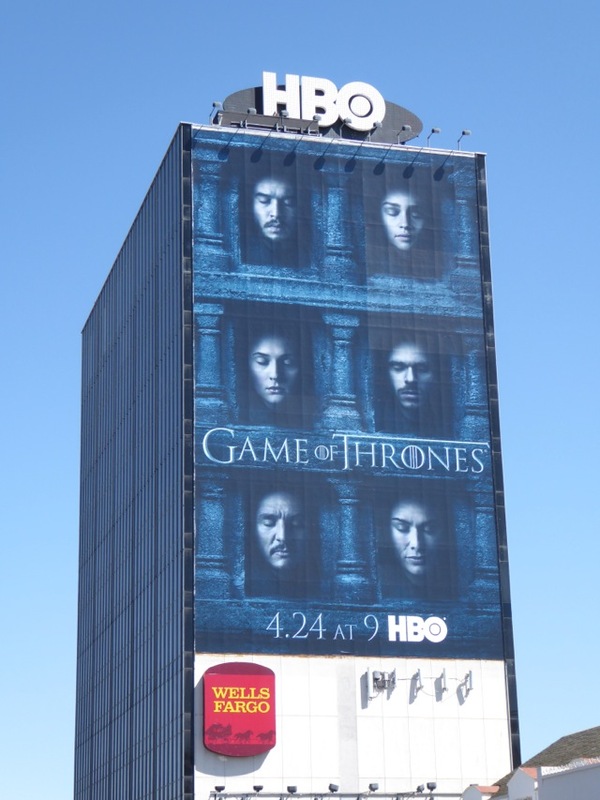 Can it really be almost time for the sixth season of HBO's Game of Thrones? Well, as they say, time flies when heads are rolling and people are dying left, right and centre. 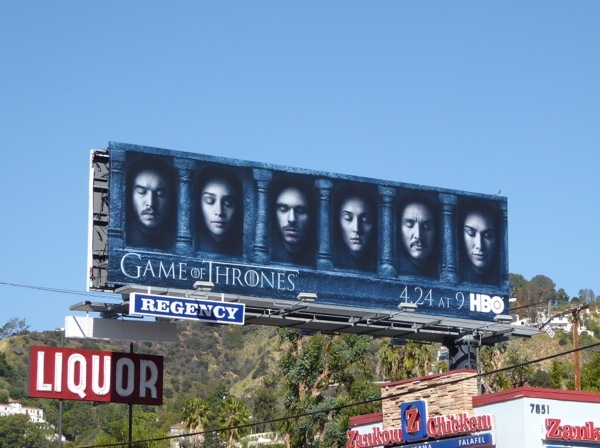 Following all the grisly, shocking deaths over the course of five seasons, this 'Hall of Faces' outdoor ad campaign seems only fitting for the Medieval fantasy show. 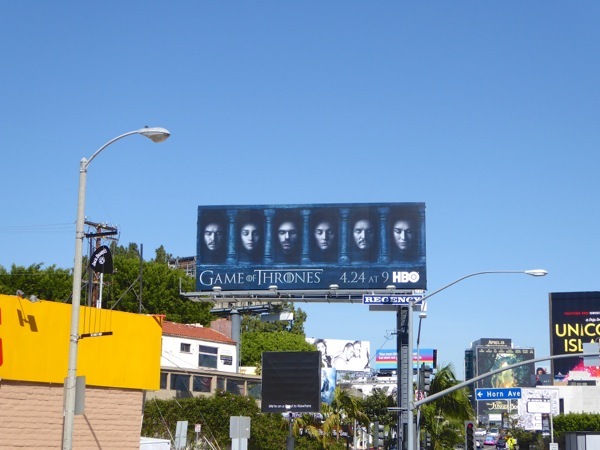 This series of billboards is a great follow up to the Game of Thrones season six teaser billboards which featured the seemingly resurrected fan-favourite 'Jon Snow', who surprisingly met a brutal end at the hands of his brothers in the Night's Watch at the end of last season. 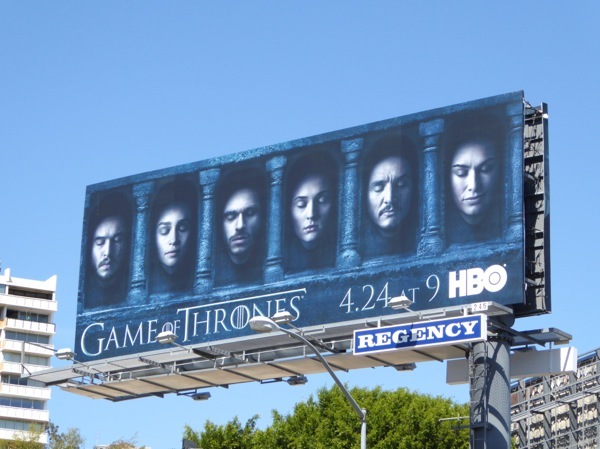 Using the Hall of Faces mausoleum vault from 'Arya Stark's' journey to the House of Black and White temple in Braavos is a great way to pay homage to all the fantastic GOT characters that have fallen, like 'Ned', 'Catelyn' and 'Rob Stark', 'Prince Oberyn', 'Joffrey Baratheon', and those that may meet their bloody demise before series end. And that's the point with GOT, no one is safe. 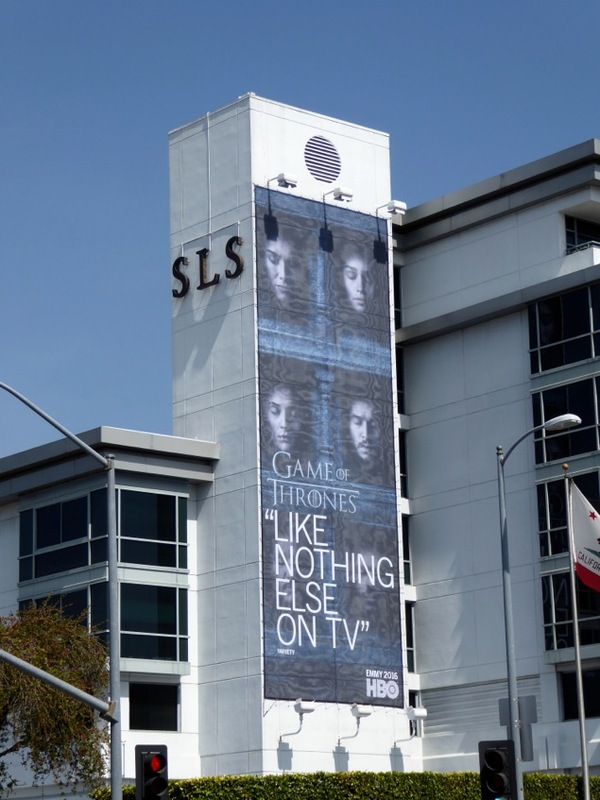 Even if you have a favourite character, there's no guarantee they will last an episode, let alone a season. 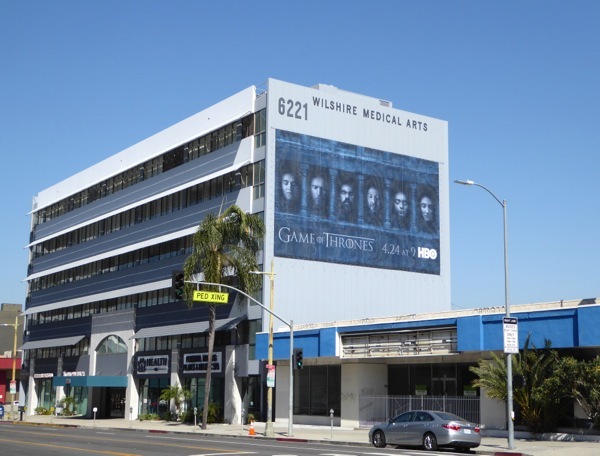 This high quality and highly-acclaimed adaptation of George R. R. Martin's novels doesn't seem to be losing any steam as this epic battle for control of the kingdoms of Westeros draws nearer to its conclusion. 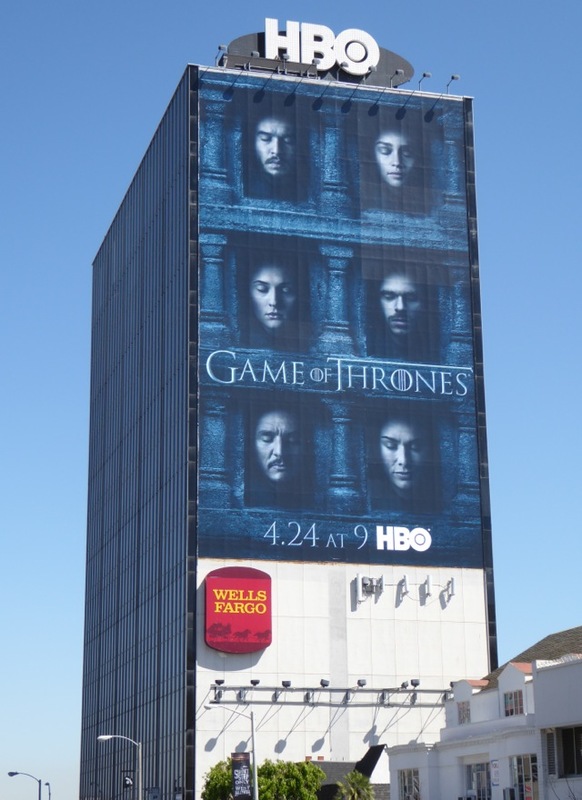 These fantastic season six billboards, including the giant-sized ad creative towering over the eastbound Sunset Strip, were photographed on March 23, 2016. 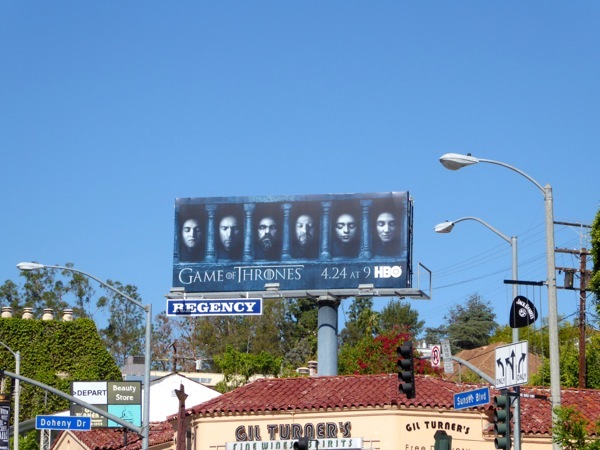 If you're a fan of the fantasy series, be sure to also check out all these previous season promo billboards for Game of Thrones since they first started to appear in the skies of L.A. in the Spring of 2011. 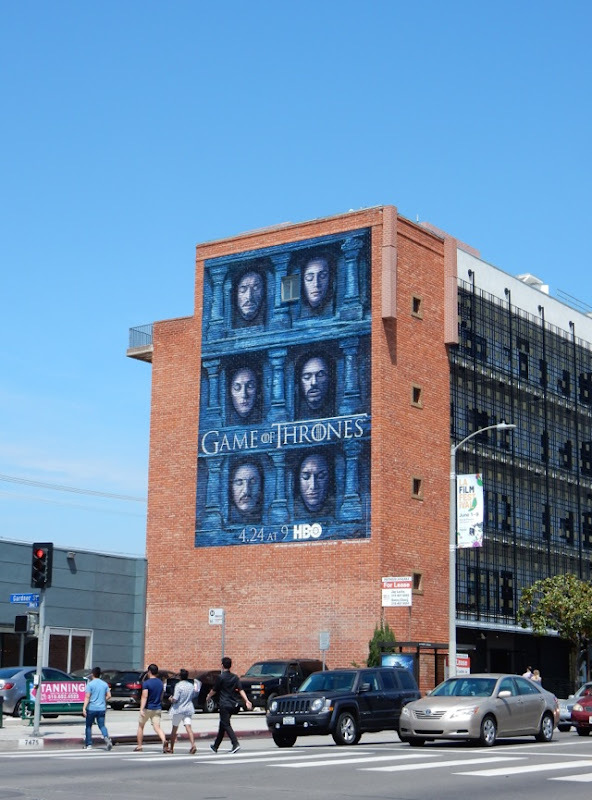 What next for GOT? 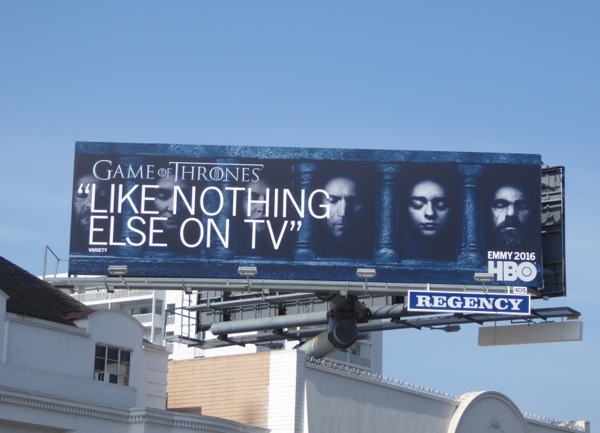 Expect Horse Lords, dragons, White Walkers, scheming, betrayal, blood and lots of death (if the past is any indication). Best to keep your eyes wide open, this is no time for sleeping on the job. 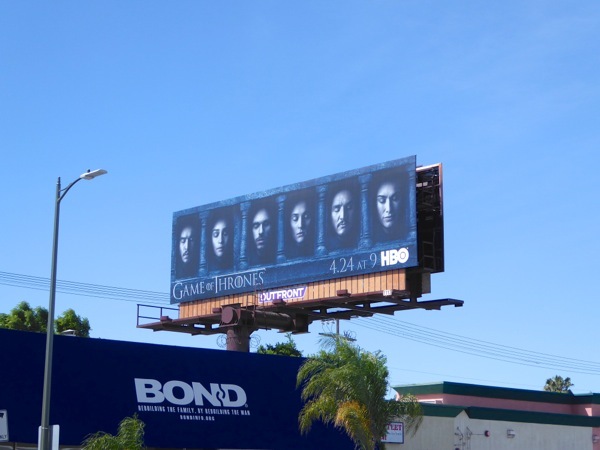 UPDATED: Here's another giant-sized billboard for the sixth season, the creative featuring the faces of Joffrey, Jaime and Tyrion Lannister and Eddard, Arya and Catelyn Stark. 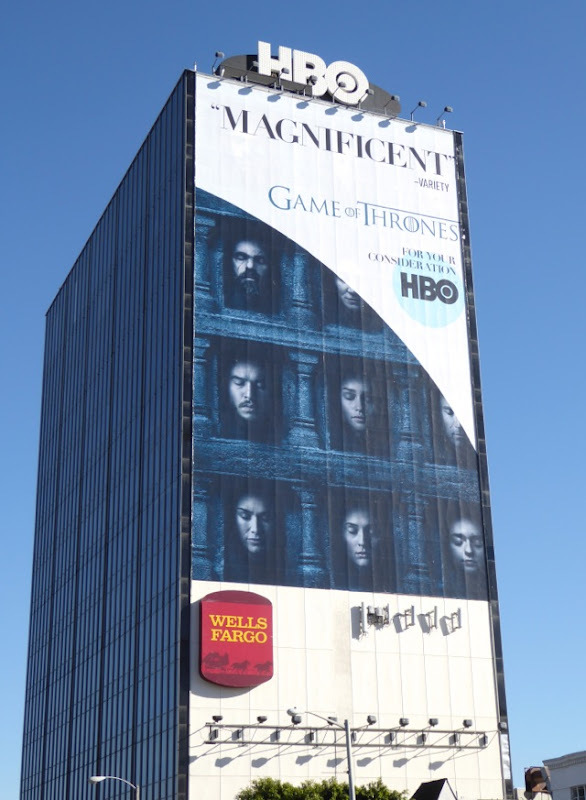 This super-sized landscape billboard was spotted along Wilshire Boulevard on April 2, 2016. 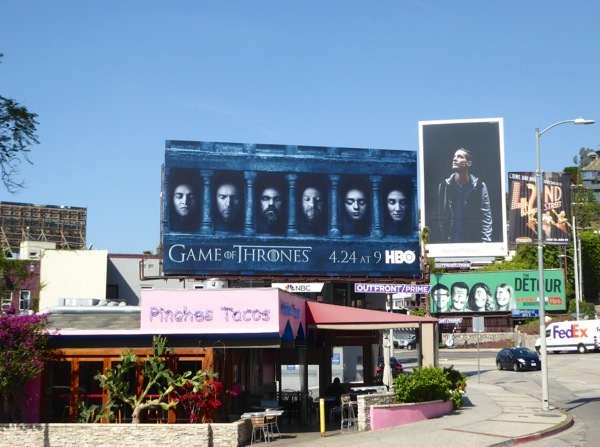 Plus here's another example standing solemn sentry over West Hollywood's Sunset Strip on April 12, 2016. 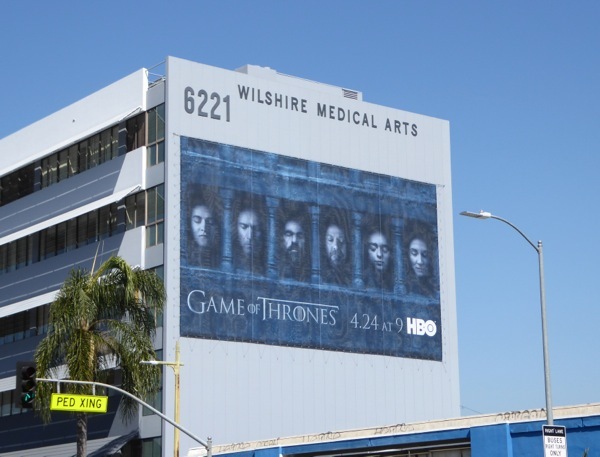 And here's another massive season six wall mural spotted along Beverly Boulevard. 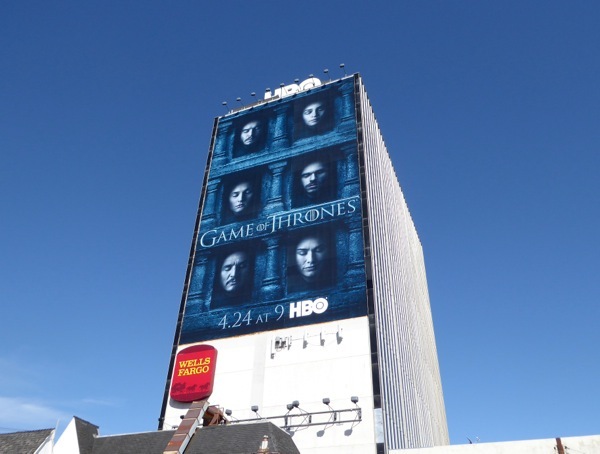 UPDATED: It's also that time of year when HBO takes over the skies with its Emmy consideration outdoor ad campaign for all its shows and original films. 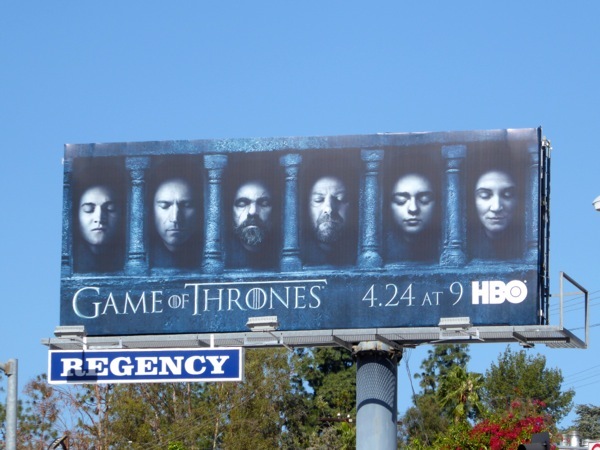 Here's the amended season six key art for Game of Thrones awards consideration snapped along the Sunset Strip and along La Cienega Boulevard on May 12 and June 3, 2016 respectively. 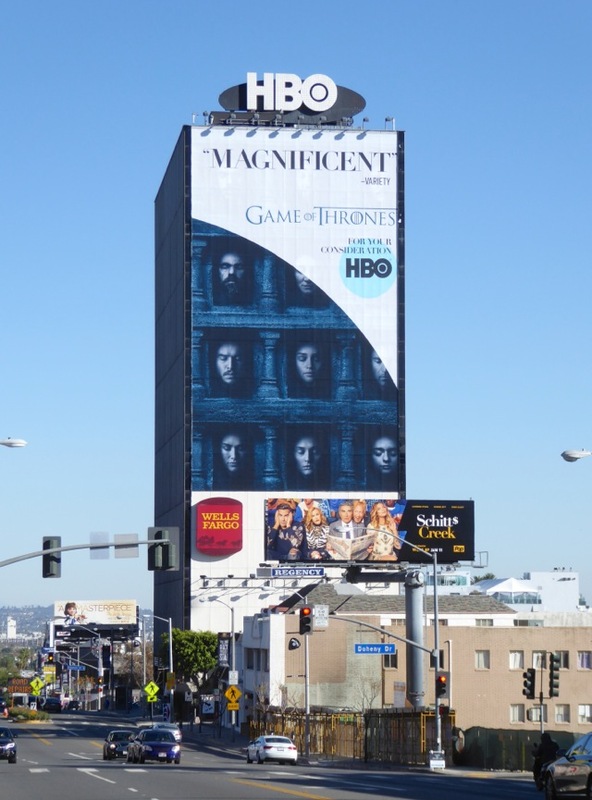 UPDATED: Following Game of Thrones win at the Critics' Choice Awards for Best Drama Series, HBO is supporting its nominations for the Golden Globes and Screen Actors Guild Awards with this 'magnificent' super-sized spectacle. 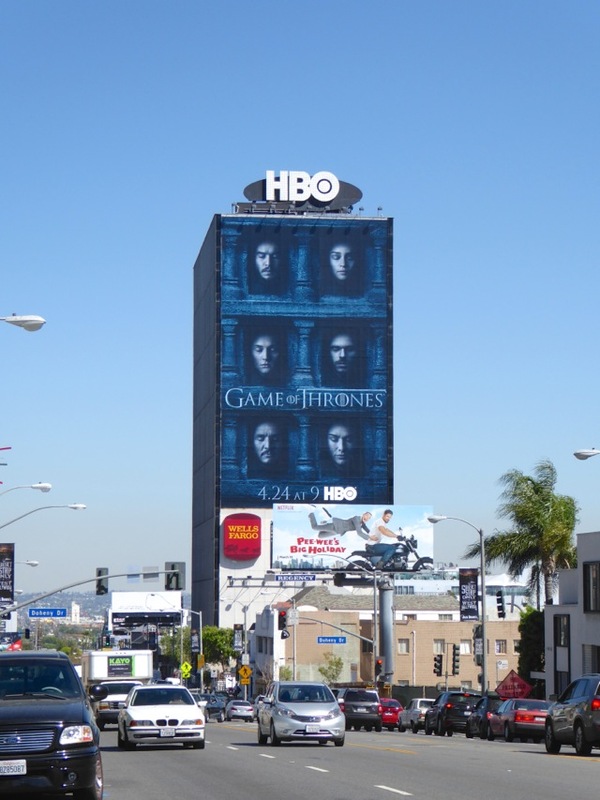 This giant billboard for the show's sixth season awards consideration was photographed towering over the Sunset Strip on December 18, 2016.